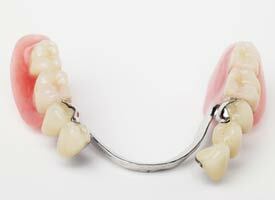 Partial dentures are fabricated with either a metal base with acrylic layered on top of the metal structure, completely out of acrylic, or a flexible, nylon based resin . A patient’s specific needs and anatomy dictate the design of the partial denture and every effort is made to construct a self-cleansing partial denture that preserves the remaining teeth and oral tissues. Dr. Daniel Carney or Dr. Tim Carney will design your partial denture so that the chewing forces are evenly distributed over the entire surfaces of the remaining teeth and soft tissues. Changes to your remaining teeth may be recommended to help equalize these forces. Metal partials are generally preferred if the patient is missing multiple teeth as they are structurally superior. They are thinner and more hygienic than an acrylic partial. Acrylic partials are typically used as a transitional or temporary partial. Flexible based partials are often used because they are often much more comfortable and esthetic to the patient. Drs. Daniel Carney or Tim Carney will consult with you to determine the appropriate partial for your situation. A removable partial denture may help limit movement of your existing natural teeth by filling missing spaces that adjacent teeth often drift in to. They also allow you to better chew food as well as aid in speech.